Today, February 11, 2014 at Manila Diamond Hotel, the Department of Tourism (DOT) launched TOURISM STAR PHILIPPINES and presented a new set of awards for individuals who have demonstrated strong and deep commitment to the country's tourism through excellent customer service and investment in tourism development efforts. Dubbed as DOT'S TOURISM STAR PHILIPPINES, the awards are divided into two (2) catergories: (i) front-liners and individuals who embody the true Filipino brand of warm hospitality, of going the extra mile in the service of tourists; and, (ii) local chief executives (LCE), a mayor or a governor, whose projects contribute positively to the tourism industry. The individuals' category is open to all Filipinos who have direct or indirect contact with tourists and who may belong to one of the following: (a) travel agencies and tour operators; (b) tour guides; (c) tourist transport (tour buses, taxis, kalesas, etc.) (d) accommodation establishments; and (e) individual service providers that may include entrepreneurs, government employees, policemen and others who do not fall under any of the mentioned sectors. An individual nominee must exhibit Filipino quality of hospitality; flexibility, adaptability and creativity; honesty; professionalism; and promptness. A potential Tourism Star from the local chief executive (LCE/ mayors or governors) category, on the other hand must have "led", headed", contributed", or "facilitated" tourism movement in their community, tourism income, and jobs creation. Nominees must not only be backed up by a list of tourism-related accomplishments, but also a proof of support to DOT regulatory and development functions such as preparation of local tourism office budget and work plan, enactment of local ordinances on mandatory accreditation and collection of tourism statistics, among others. The LCE Star nominees will be judged according to institutional, promotions, planning and product development, regulatory, investments, centerpiece projects, support to DOT advocacies and best practices in tourism. The local government community of the LCE Tourism Star shall receive a maximum of PhP1-M worth of funding for a community-based tourism project proposed by the awardee (may be in the form of a training, a livelihood project, or a product development or enhancement initiative), a bronze marker to be placed conspicuously in his jurisdiction, free participation/booth space in a market-matched international travel fair, display of the DOT Tourism STAR logo in the LGU's website, and a trophy to be awarded by no less that President Benigno Aquino III. Other prizes for the awardees will be given by the program sponsors Bank of the Philippine Islands (BPI), MyPhone, Duty Free Philippines (DFP), and the Technical Education Skills Development Authority (TESDA). DOT Undersecretary Maria Victoria V. Jasmin said this award is one way of recognizing the valuable contributions made by the people from the tourism industry and local government units alike. "The Tourism Star Philippines celebrates the excellence and dedication exemplified by these industry people in driving the country's tourism forward," she added. 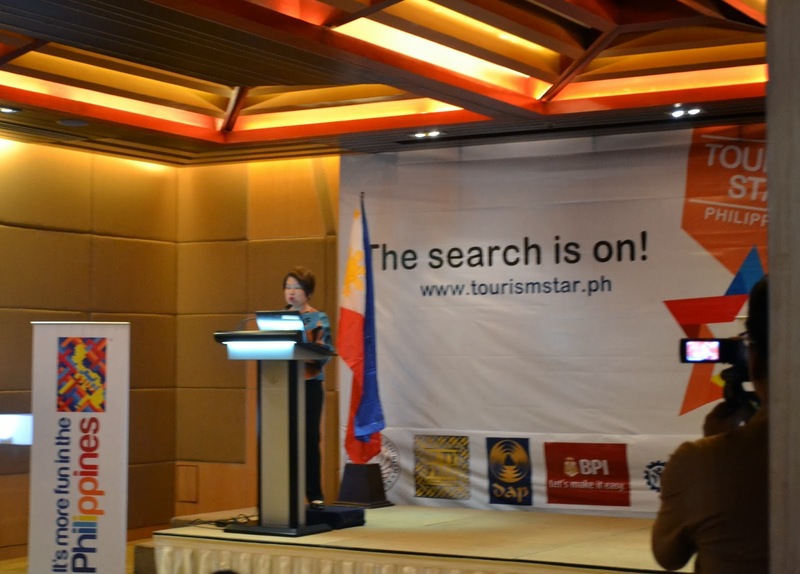 The DOT Tourism Star Philippines is also linked to the Department's branding campaign It's More Fun in the Philippines". The Tourism chief is also giving out the Secretary's Award, a token and a special recognition chosen by the department head for individuals, associations or institutions that made remarkable contribution in any field which support Philippine Tourism. "The awards program is in honor of the tremendous contribution of many Filipinos in what is now the fastest growing industry in the country, a priority sector that is able to drive inclusive economic growth, one that is worth PhP571.3 billion in the nation's GDP. It brings to the fore the core strength of our tourism campaign, the Filipino brand of warm hospitality and our commitment to service and outstanding visitor experience" Secretary Ramon Jimenez, Jr. shared. The program will also mark a significant milestone in the DOT, as it fully implements the National Tourism Development Plan (NTDP) which leverages on public-private sector partnerships to improve competitiveness of tourism facilities and services, capacitate local government units, ensure sustainable tourism development and initiate focused marketing and promotions. "Hopefully, the DOT's Tourism Star Philippines would not only engage more individuals and local chief executives alike to take more proactive roles in our efforts or raising competitiveness in tourism, but also in instilling in every Filipino the culture of tourism. The success or failure of tourism largely depends on how people will respond to the call of nation-building. And that the power is in the people's hand. We are, therefore, counting on their continued dedication and commitment to our bid towards achieving 10 million international arrivals and most importantly generating seven million jobs by 2016," the tourism chief added. The deadline for submission of nominations is on May 31 of every year. The first awarding ceremony will be held in September 2014, in time for the Tourism Week celebration. President Benigno Aquino III will be conferring the award to the recipients. For more information, please visit www.tourismstar.ph.